Marta Alige was a pioneer. She was one of the first generation of girls to grow up educated in peacetime Mozambique, and one of the first generation of Mozambican missionaries. When she finished school, instead of moving to the city looking for work, she was trained by Youth With A Mission, and spent the rest of her short life working as a frontier missionary in the isolated Zambezi delta. For ten years YWAM Marromeu has worked in this delta region. 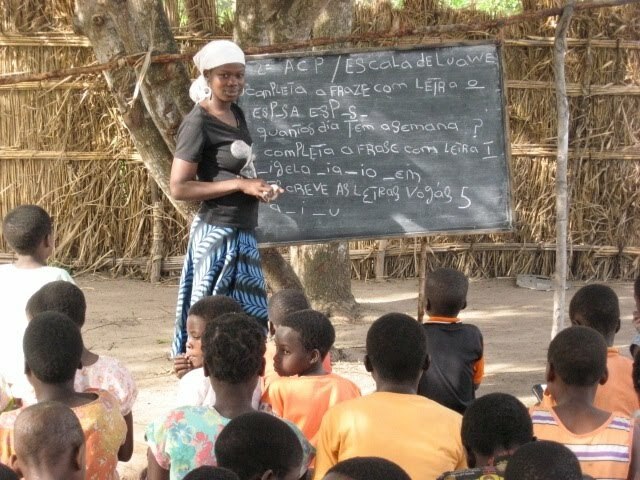 Education has always been a huge felt need for the Mozambicans there, living far from the nearest schools. YWAM leaders, Shephen and Caitlin Mbewe, both trained schoolteachers, are committed to develop education in this area, where poverty and illiteracy are rife. Several years ago, after completing her DTS in Marromeu, Marta began the first primary school in the delta. Her husband Pedrito lived with her in the delta, running a small first aid post. Slowly, with the held of a fellow YWAMer, Tiago, and a government teacher, Marta developed the school. Steady progress has now been made in teaching literacy, though the number of simple books in the local Sena language is limited. Many outreach teams have also helped with the literacy programme, flown into remote delta villages by helicopter, generously provided by Mercy Air. With the motto, ‘Wings of love to people in need’, South Africa’s Mercy Air has accelerated the speed with which the YWAM team is able to travel, reducing three-day canoe trips to 30 minutes. Tragically, in late 2010, Marta Alige died, after complications during a Ceasarean Section. Still today, two decades after Mozambique’s civil war ended, one in thirty seven Mozambican women die in childbirth. Thankfully Marta’s story does not finish here, however. The work she started has been continued through the lives of three teenage YWAM girls. Caitlin, and her three daughters, Nyasha, Kudzai and Tatenda, wanted to do something special to remember Marta. They translated a traditional African folk tale into Sena, doing the artwork themselves. ‘Why does the eagle steal the hen’s chicks?’ has now been published, dedicated to the memory of Marta. The book was recently given to children living in the delta, who Marta had taught. Fifteen-year old Nyasha comments, “Everyone loved it. Even the ones who could not read could follow the story by looking at the pictures, and could recognize words in the story from the vocabulary pages. It was so exhilarating! Everyone was so disappointed when the story came to an end - it made me wish I had more books. I want to bring reading alive for them." The day after giving the books out in Luawe, Caitlin visited Bumbani, another village in the delta, to check on the progress of the reading scheme she had introduced earlier in 2010. She found that many of those attending the programme could already read all the word cards that she had provided. Now their great need is books. Recently, Caitlin made an emergency trip to South Africa. Whilst there, some wonderful partnerships began. She met Anne Herbert, the Outreach Coordinator for Mercy Air, with 27 years experience teaching primary education. More people heard about the Sena literacy programme and began donating their time and skills. A team from South Africa are now creating a ‘Classroom in a box’, containing practical literacy materials that can be easily carried into remote areas. Today the Mbewes are busy translating further African folk tales into Sena, as easy readers for the learners. Enthusiastic artists from supporting churches in the United Kingdom are helping with culturally appropriate artwork. Plans are afoot to publish short bible stories and challenging books that will help build a biblical worldview. A generation of Mozambicans living in the Zambezi delta now have the opportunity to learn to read and write. For the women in particular, education offers the possibility of radical transformation. Marta did not have formal training, only 5 years of primary school. It was Martin Luther King who said, "One does not need a degree to serve." Marta proved that to be true, she served the children of the delta with love and devotion, and her short life will bear much fruit.